Situated on the left side of a historic field stone building, Terra, a one star Michelin restaurant serves contemporary American cuisine; on the other side Bar Terra offers a lighter, casual menu. Steve and I enjoyed a wonderful meal at Terra. The space is dimly lit with exposed stone walls and wooden ceiling beams. I love the structure of the menu. There are 15 savory plates and 5 dessert offerings; you can choose between 4 ($75), 5 ($90) or 6 ($102) courses. Steve and I opted for the 4 course meal, which meant we were able to try 8 (7 savory and 1 dessert) dishes between us. His first course was amazing. 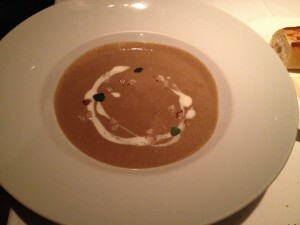 It was a porcini mushroom soup that was so intensely flavorful I thought of as liquid mushroom gold. 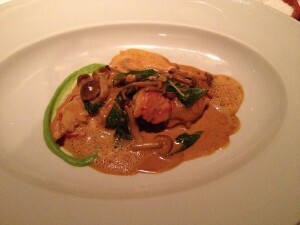 My lobster tortelloni with tarragon and Shimeji mushrooms was delicious as well, but paled in comparison to his soup. My sake marinated Alaskan black cod and shrimp dumplings in shiso broth was the star of the meal. The silky texture of the fish was unparalleled. One of the best fish dishes I have ever had. 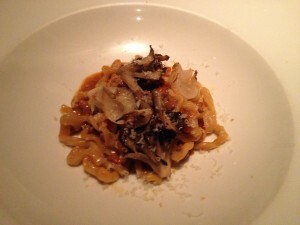 Steve’s second course was umbricelli pasta with a ragu of Liberty farm duck, maitake and cipollini onions. The pasta was a perfectly toothsome, but the duck was not particularly distinctive. 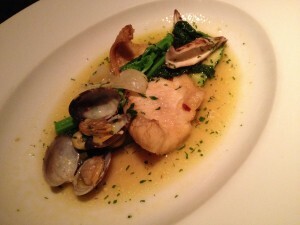 Steve’s third course was the acqua pazza “Market Fish Cooked in Our ‘Crazy Water’”. I’ll be honest, I do not remember what the fish was, other than the fact it was good, but not as good as the amazing black cod. I loved the crispy sweetbreads; the portion was generous and meaty, however the Jerusalem artichokes did not add much to the dish. 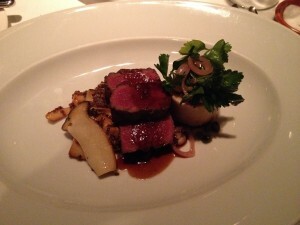 My last course was grilled Brandt family strip steak with marrow, foraged mushrooms and red wine sauce. The steak was definitely undercooked, but luckily I’m okay with rare. The beef was tasty, but uninteresting. 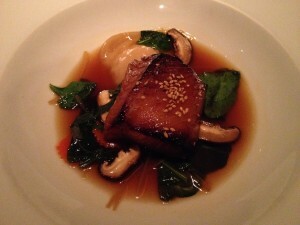 The mushrooms were excellent; someone in the Terra kitchen really knows their fungi. 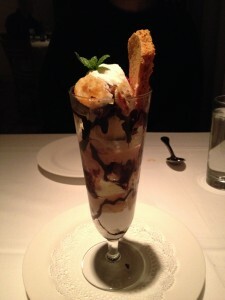 For dessert, we shared the chocolate brownie parfait. Rich chunks of brownie were layered with vanilla bean ice cream, caramelized bananas and fudge sauce. The ice cream was the only major falling of the meal – it was over-churned, resulting in a stiff mealy texture. Frankly, I was really surprised that they would send out such a sub-par component – It was a sore thumb in an otherwise stellar meal. 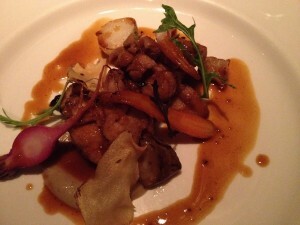 Our service was excellent – unobtrusively attentive, as you expect in a 1-star Michelin restaurant. The baguette came with a “be careful, it’s hot from the oven,” warning, which are my favorite words when it comes to bread.